Contact Scuba Ventures for additional information and bookings. 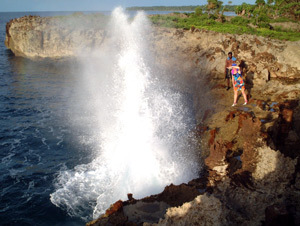 The Blow Holes is on the Northern Tip of Nusa Lavu Island, which means big Island, just across the channel from Nusa Island Retreat. you can use paths through the island. A guide from Nusa can be arranged. 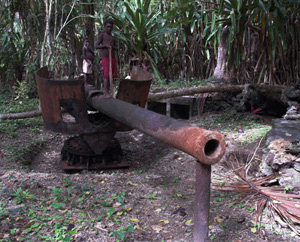 Just back from the blow holes are two big Japanese guns and a bunker, interesting remnants of the Japanese occupation of Kavieng during World WarII. A walk on Nusa Lavu is an interesting combination of island and history tour. 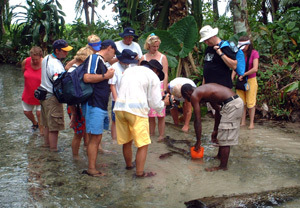 Easily accesible from Nusa Island and included as a guided walk for dive groups staying at the resort. Great way to spend an afternoon. 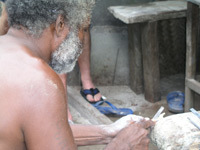 the local craftsman at work making jewellery and carvings. For those interested a weaving demonstration/lessons can be arranged by the Nusa Lik womans group. Nusa Island Retreat is committed to a harmonious community environment and community development. A range of projects have already been undertaken and more are in various stages of planning. 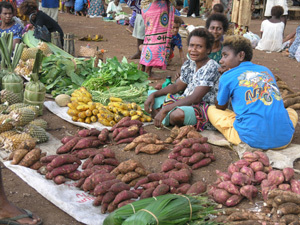 In the past, the community of Nusa often ran out of clean drinking water and would rely on the Retreat to provide water for drinking and cooking or would have to travel to Kavieng to source water. Toilet facilities were also non-existent. Since the community relies on ground water, it was important that we acted to protect this resource and provided sanitary toilet options. In total,four dry composting toilet facilities have been installed around the island with four 2000-gallon water tanks. 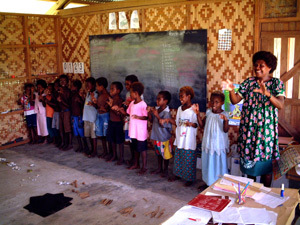 In late 2002 a new elementary (pre-school) was built to ensure education facilities were provided to the pre-school children. These children are too young to be commuting to the mainland by themselves to attend pre-school. Two elementary teachers have been appointed to teach the classes. Four 2000 Gallon rainwater tanks are connected to the building to further ensure adequate rainwater supplies for the community. 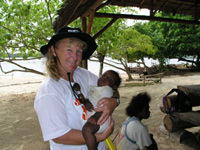 This project was made possible with AusAid support. Donations of stationary, games, sporting goods and books are much appreciated. Departing the resort your tour begins with a brief introduction to the town of Kavieng the administrative center of New Ireland Province. Your bus stops briefly at the memorial park where a brief history of two world wars & their effects on Kavieng will be given. Passing by the local markets where on market days a variety of local produce can be seen the tour next stops at the old town cemetery to see the grave of Baron Von Boluminski the first German administrator who was instrumental in the very early development of the province. A brief stop at a large Japanese gun is made before turning at the site of the Japanese sea plane base with views out over the nearby islands & heading past the local golf club & the site of the Japanese command bunker before heading down the Boluminski highway. The tour passes through typical rural New Ireland passing through many villages before stopping at the Tree House Village Resort to take a look at what may be the world’s largest tree house. Continuing further along the highway the tour enters the oil palm growing areas of the province where a drive through one of the many estates allows a closer look at this versatile & lucrative crop with a brief explanation of it’s many uses being given. The tour after passing through center of the oil palm industry, Lukuramau, next calls at Larabina village where our host Kathy Yiob has tamed a number of large fresh water eels which she feeds on tin fish. Ample photo opportunities exist here to captur e these gentle giants on film whilst Kathy gives a fascinating insight into life with the eels. A further ten minutes along the highway brings the tour to Fissoa village on the banks of a beautiful river & also the home of the Fissoa training center, a church run school for boys who have been unable to obtain places in high schools which focuses on teaching practical skills such as carpentry & mechanics. 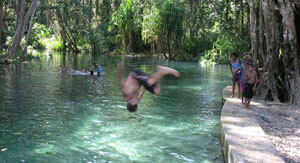 The school has set up a lovely picnic area by the river & a swim in the cold rivers is most invigorating. Great photo opportunities exist here particularly if the boys are practicing their acrobatic skills swinging from ropes tied to a tree hanging over the river. This is the turn around point for the tour which then heads back along the highway stopping where required for photo opportunities. The favorite activity on the return trip is “spot the pigs” as pigs return with villagers from their gardens in the cool of the late afternoon. Your tour returns to the resort in time for a refreshing shower & pre dinner drinks on the pool deck before indulging in a Kavieng sea food meal in the Nusa Restaurant. Your tour departs the resort after a hearty breakfast. Proceeding through the old china town area of Kavieng your bus joins the Boluminski highway at the end of the air strip. The tour passes through typical rural New Ireland passing through many villages before stopping at the Tree House Village resort to take a look at what may be the world’s largest tree house. Continuing further along the highway the tour enters the oil palm growing areas of the province where a drive through one of the many estates allows a closer look at this versatile & lucrative crop with a brief explanation of it’s many uses being given. The tour after passing through the center of the oil palm industry, Lukuramau, next calls at Larabina village where our host Kathy Yiob has tamed a number of large fresh water eels which she feeds on tin fish. Ample photo opportunities exist here to capture these gentle giants on film whilst Kathy gives a fascinating insight into life with the eels. Proceeding further down the highway winding through the many oil palm & coconut plantations the tour passes through a number of large villages before arriving at Libba village notable for it’s large church with intricately carved poles & home to Ben Sissia one of only a handful of master carvers of the renowned Malagan carvings. This charming gentleman openly discusses his work with visitors & usually has a number of pieces in the making or finished & available for purchase by visitors. The tour turns here & heads back to Fissoa village home of the Fissoa Training Centre a church run center for boys unable to obtain places in high schools & focusing on teaching practical skills such as carpentry & mechanics. Here a picnic lunch is taken as well as a swim in the refreshingly cool river waters where entertainment is often provided by the school boys demonstrating their aerobatic skills on ropes tied to a tree overhanging the river. The tour then heads back along the highway stopping as required for photographic opportunities. The favorite activity on the return trip is “spot the pig” as pigs return with villagers from their gardens in the cool of the late afternoon. Your tour returns in time for a refreshing shower & pre dinner drinks on the pool deck before indulging in a Kavieng seafood meal in the Nusa Restaurant. For those with a couple of hours to kill in the cool of the afternoon & who don’t mind a little mild exercise this tour musters at the photographic wall in the reception area. Here your guide will give you a brief history of the island from it’s first discovery as it is known along with commentary on the various historical photos on the wall. Leaving the resort a short walk along the waterfront you can see one of the many natural fresh water springs which gush literally thousands of gallons of fresh water into the ocean daily. Almost opposite these springs are a number of Japanese caves which formed part of the harbor defenses during the Japanese occupation of Kavieng during the second world war. A short walk further along the waterfront brings us to the memorial park where Australian & New Zealand forces from two world wars are honored & a plaque listing the names of 96 civilians who lost their lives as a result of Japanese occupation during world war 2. Further along the waterfront we come to the markets where we cross a low ridge overlooking the town golf course & the remains of the Japanese command bunker. A further walk up the main street brings us to a small park containing the barrel of a Japanese naval gun & a huge structure which formed the base of a number of searchlight installations used as part of the airfield defenses during the war. The tour then proceeds back to the resort with people sometimes choosing to browse through some of the many Chinese trade stores along the way. Culture & History: Malagan Carvers and Malagan artefacts, manufacture of traditional currency, village life and activities, Malagan feasts (if available), traditional uses of Coconut palm and its nuts, sago palm and its local uses, World War II relics. Nature: Scenic Tours on the famous Boluminski Highway, eel farm feeding at Laraibina, firefly watching at night, Bush walk and Trekking at Kaut or Lalipass, bird and butterfly watching, shark calling at Kontu, Kono and Messi on the west coast of Madak and Barok areas. Also, they can easily organise snorkelling, surfing, and fishing on outlying islands. They can also assist with export of souvenirs. Luma can arrange tours for a group of four (4) people or more, for a half a day to six days or more depending on your interest. Less than four people can still be done if the clients or client is willing to meet additional costs. Kavieng Market, then visit nearby WWII relics (Harbour Look-out Ridge, Kuvak WW II Bunker), a visit to Carteret Primary School (Government), Kulangit Guns and the Japanese Army under-ground Power Supply House, a visit to UC Regional HQ at Ligga and finally Utu Provincial High School. 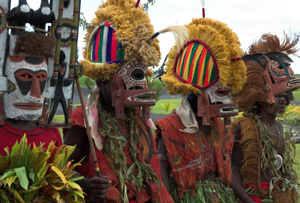 Stop at Balus hamlet and visit the traditional shell money manufacturers; then a short walk nearby to the World’s largest Tree House – 3-stories high; then drive on to Lakurumau Oil Palm Plantations H/Qs and visit Oil Palm Processing mill. Then a short drive to the Eel Farm and see Eels feeding at Laraibina Village. 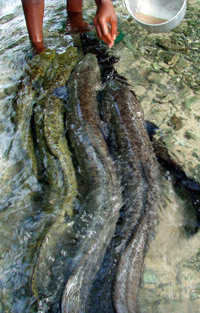 Have a go at feeding the eels; not many people know about these animals and their life cycle. When they are old, they travel up stream and disappear. For a life experience, try feeding these monsters! Have a short rest, and then drive back to Kavieng. As the Half Day tour, but after feeding the eels, we continue cruising along the picturesque coastline, and see some of the most gorgeous spots the province had been blessed with; rarely are you more than a few meters from white sandy beaches. Some of our Provincial High Schools are situated along the Boluminski Highway. If interested a stop at one of them could be worthwhile. See the school’s environment, and if allowed, you may visit a class or two. Have lunch at Fissoa Vocational Center’s picnic and swimming place. After Lunch break, drive on to Tandis and see mat-weaving by UC Womens’ Fellowship group. Then a short drive to Libba to see the famous Malagan carver, Ben Sisia and some of his very talented Malagan carver’s artworks. 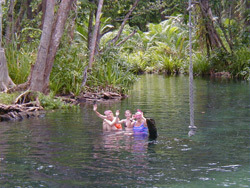 Continue the drive to Konos Sub-District HQs and may prefer a cool swim at the Konos Stream before returning back to Kavieng. All our prices include all transport, driver/guide, entry fees, eel food, lunch on full day tour, GST. 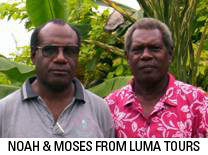 The Principles of the business are Moses B K Makis and Noah J Lurang. Both these men have a good background knowledge of the Province and the people. They are New Irelanders themselves by birth and have extensive knowledge and understanding of the local people and the culture. Moses M K Makis – is a former Provincial Administrator with over twenty years of experience at various levels of responsibilities in the Public Service, both at national and provincial level. Moses comes from Djaul Island on the south-western end of New Ireland mainland. Noah J Lurang – is a former educationist and then a Provincial Advisor for Culture and Tourism. He has well over twenty years of continued engagement at various levels in Provincial administration. Noah comes from Tatau Island in the Tabar Group on the north-east of New Ireland mainland. Copyright © 2019 Scuba Ventures Kavieng. Powered by WordPress. Theme: Accelerate by ThemeGrill.